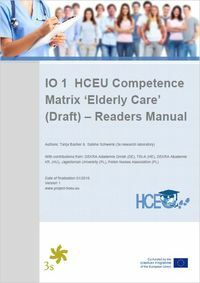 Competence development matrix "PROFESSIONAL CARE"
The HCEU matrix on "Professional Care" describes the steps of competence development in the fields of nursing and elderly care starting with helper professions within those professional fields up to Bachelor level. Competence development is described based on work processes/ competence areas and transversal competence areas identified as representative for the core tasks within the fields of nursing and elderly care. The matrix has been developed by the transnational expert consortium of the HCEU project including perspectives from AT, DE, HE, HU, PL, under consideration of inputs from further European and non-European countries and validated in the framework of transnational validation workshops. The HCEU competence matrix unfolds its greatest practical benefit here in its virtual representation. The three-dimensional matrix displays differences in the qualifications of nursing professionals from different countries and also shows the missing pieces of the puzzle - in direct comparison of two national organisational profiles. This visualisation of the matrix is of benefit for all those involved in the work and recognition process. This information can also be used to generate specific training content. An instrument such as the HCEU competence matrix offers answers and solutions for difficulties that have already arisen in a number of occupational fields within recognition practice. There is currently no comparable instrument in Europe like the HCEU competence matrix to facilitate the understanding, transparency and comparability of qualifications and to make them applicable across borders. 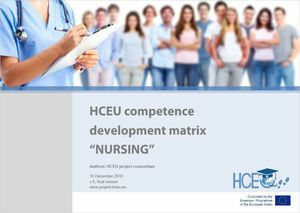 The HCEU matrix on "Nursing" describes the steps of competence development in the field of nursing starting with helper professions within nursing up to Bachelor level. Competence development is described based on work processes/ competence areas and transversal competence areas identified as representative for the overall field of nursing. The matrix has been developed by the transnational expert consortium of the HCEU project including perspectives from AT, DE, HE, HU, PL and validated in the framework of two transnational validation workshops. Competence development matrix "ELDERLY CARE"
The VQTS matrix on elderly care describes the steps of competence development of elderly care workers from novice to expert based on the working tasks identified as resprentative for elderly care. The matrix at hand is a revision of the NoBoMa project matrix carried out in the HCEU project. The download version contains in addition a users manual on the VQTS matrix. This kit provides a set of guidelines and tools necessary to transfer the HCEU matrices also to other destination countries of health care professionals. It aims to facilitate the sustainability of the project results after the projects conclusion and within the Health Care sector and systems outside of the project’s geographical scope. 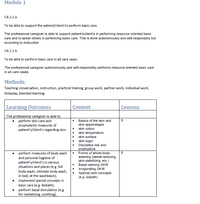 In order to further operationalise the HCEU Matrix ‘Professional Care’, five competenceareas have been further specified and backed up with learning outcomes necessary in order to perform a specific work process (and its competence development steps competently. The descriptors used by the European Qualifications Framework (EQR) have been used in order to specify learning outcomes and provide a sound basis for referencing the learning outcomes used in the HCEU matrix also with national curricula that have been specified using "knowledge", "skills" and "comeptences" as used by the EQR. 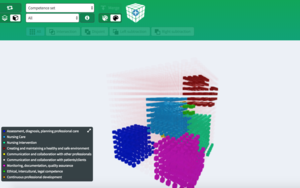 The Learning Outcomes are also available in the virtual matrix in all project languages and here. The basic idea of the concept of organisational profile is that professional care refers to specific work processes apparent in all countries. Every qualification (degree/ diploma/ certificate) in professional care reflects the extent to which holders of the qualification are able to conduct these work processes at the time of graduation and based on learning outcomes of the specific programme they attended. The ’Οrganisational Profile‘ aims to be precisely this: the ‘total’ of knowledge, skills, and competences, related with a specific qualification, as exhibited by the ‘standard‘ holder of the qualification upon graduation. In turn, comparing Organisational Profiles virtually means comparing what fresh holders of various qualifications are actually able to do. Organisational profiles have been developed for selected qualifications/ certificates in the project countries and further European and non-European countries. An overview of those organisational profiles based on the competence development steps reached is available here. All organisational profiles (specified on learning outcomes level) are available in the virtual matrix. This tool kit is produced to provide guidelines and a research methodology on the development of Organisational Profiles. The kit incorporates the methodology applied in the project and also draws from the experience acquired. The HCEU matrix does not only allow the displaying of organisational profiles but also the displaying of individual learners or professionals competence profiles. A kit has been exemplary developed on how such individuals competences can be identified and documented based on a well tested and widely used tool within validation praxis. The HCEU Employer Kit offers the opportunity to develop employer requirement profiles. In such profiles, competence needs of departments and/or certain activities are addressed. They can help to describe jobs with a high requirement profile and to make suitable employees visible. The employer needs profiles defined by the competence requirements can be displayed on the virtual matrix and can be compared with other profiles. 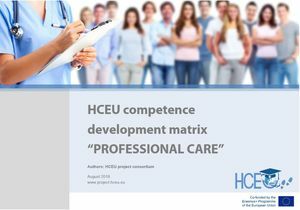 Our brochure on the HCEU competence development matrix "Professional Care" describes in a very short and concise manner how the matrix has been developed and how it can be used within recognition praxis. It therefore primarily addresses recognition bodies across Europe interested in working with the HCEU matrix. The brochure is available in EN and DE. Making qualifications comparable is not the final step in order to enable the mobility of workers on the European labour market. Since health care qualifications/ certificates are different across national and institutional borders here in Europe it is very likely that the matrices in the home country do not fit in all aspects with the ones of the destination country. It is therefore necessary to find ways to bridge those deviations when they are representing deficits in order to facilitate recognition in the destination country. For this purpose HCEU identify and define joint transnational learning modules in order to provide bridges in between existing qualifications within recognition processes. The learning modules are based on IO3 Learning Outcomes and and thus support and prepare the recognition process and of course the start in the new job opportunity . The HCEU project applied numerous methods including expert interviews, work-related comparison of existing qualification profiles and moderated workshops with experts from the respective occupational fields, developing a competence matrix including competence areas, its validation and revision by experts (VQTS approach, i.e. Vocational Qualification Training System). The research report documents, summarises and critically reflects on the work done in the project and aims at providing practitioners, policy makers and researchers with new approaches and insights into promoting Health Care in the EU. 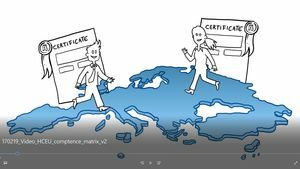 The video explains the mode of action of the HCEU matrix "Professional Care" within its application context transnational mobility of healthcare professionals in and to Europe. It describes how the matrix supports recognition processes and how it can facilitate transition processes of professionals from one country to another.